In celebration of Halloween, I’ll be scouring the internet in search of online bingo promotions and Halloween themed bingo games. However, to me, October is so much more than Halloween. October is National Breast Cancer Awareness Month. Since breast cancer is such a very real concern for so many of us bingo chicks, we wanted to remind you to schedule that annual mammogram, and provide you with some other breast cancer related resources... and then we will get right back to the subject of bingo, promise. Because we care about you, here is your reminder from Bingo Chicks. 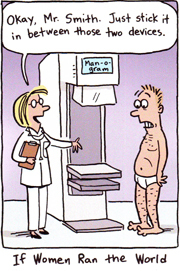 One, if you're over the age of 40, schedule your monthly breast exam today. If you've just turned 40 this month, Happy Birthday! Enjoy! Whether or not you're over the age of 40, you should be performing self exams on a monthly basis, if you need instructions, or a refresher course, we have that here for you, straight from the National Breast Cancer Organization. Did you know however that the bingo industry as a whole has been a major contributor in the fight against cancer? Much of this is to do with the fact that in both the United Kingdom, and much of the United States, bingo halls must donate a portion of their proceeds to various charities. Bingo being a game where with breasts a plenty, it’s only natural to assume that this is an important issue for bingo players, promoters, and, everyone in the industry that likes breasts, be they male or female.